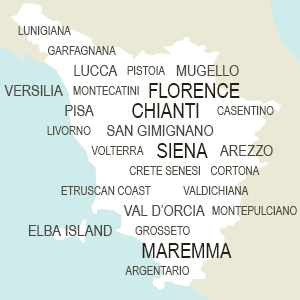 The city of Montalcino is a main destination in the province of Siena. It is located in the stunning Val d'Orcia and is renowned for its valuable red wine, the Brunello that together with Chianti and Montepulciano is one of the most appreciated wine around the world. The city center id enclosed in the ancient walls and is overlooked by the fortress built in 1361. Inside the Museums there are some beautiful Sienese artworks such as the Saints Peter and Paul by Ambrogio Lorenzetti and a Madonna with Child by Simone Martini. In the surroundings of Montalcino there is the stunning Abbey of Sant'Antimo, important example of Romanesque architecture in Tuscany. Legend has it that it was built over the ruins of a chapel built by Charlemagne. Notice the beautiful apse formed by radial chapels.